Was this a Freudian slip, betraying the prez's wish to bring back child labor? Trump posted a graphic in which he celebrates "putting our minors back to work." A SHORT UPDATE on Trump’s mental health. I’m not entirely sure if the unraveling is intensifying or if there was anything raveled in the first place. But it’s important to keep stating the obvious. The great difficulty of living with someone who is seriously delusional is that you eventually acclimate to it, find yourself responding to it, and thereby eventually lose any solid sense of reality itself. 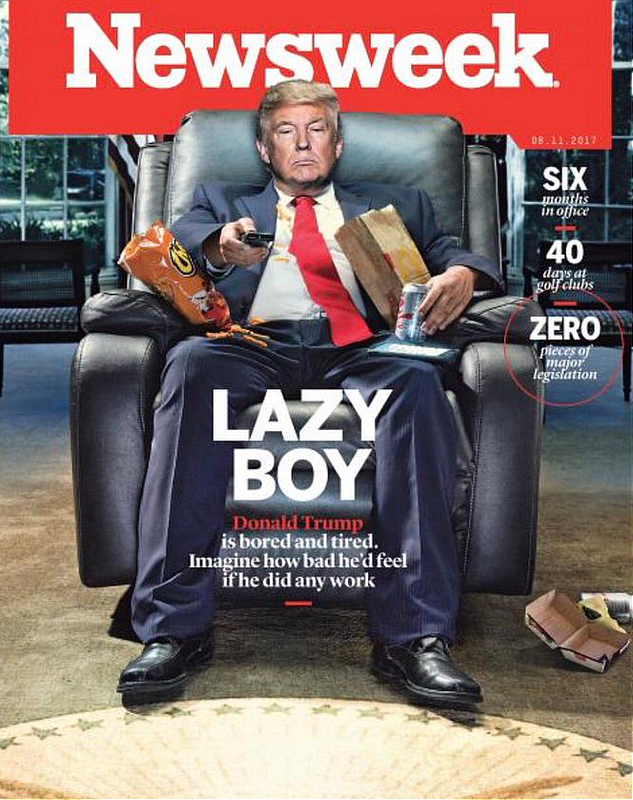 So let me just say that there is something profoundly unhinged about someone who creates a fake Time magazine cover about himself and has the photo framed and hanging in several of his properties and, when this is revealed, refuses to say anything about it. It’s a delusional, absurd form of pathological narcissism and deceit that should, in any sane country, lead to his removal from office. It’s of a pattern with his completely psychotic statements about his inaugural crowds, Obama’s alleged wiretapping, the various health-care plans he has no understanding of, the tweeting “foreign policy” that is fast destroying the credibility of his own secretary of State, the invention of “intelligence” about North Korea, and the simply whack-job, misogynistic attacks on Mika Brzezinski and Joe Scarborough. There is no precedent for this behavior in the Oval Office in American history, even in Nixon’s deranged final days. The case for impeachment seems to me, at this point, far less salient than the invocation of the 25th Amendment. If someone this unstable, this delusional, and this unwell cannot be removed from office, who can? PS, unlike the poster of the video, I don't find this funny. Man needs to be evaluated by an objective medical professional (not that weird 'doctor' who released Trump's phony health report during the campaign). 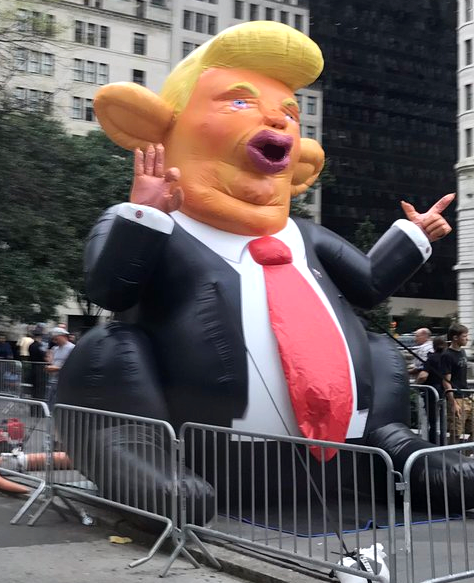 Implausably and uncomprehendingly, they're still supporting him. A SELF-DESCRIBED "email prankster" in the UK fooled a number of White House officials into thinking he was other officials, including an episode where he convinced the White House official tasked with cyber security that he was Jared Kushner and received that official's private email address unsolicited. The emails were shared with CNN by the email prankster. "Tom, we are arranging a bit of a soirée towards the end of August," the fake Jared Kushner on an Outlook account wrote to the official White House email account of Homeland Security Adviser Tom Bossert. "It would be great if you could make it, I promise food of at least comparible (sic) quality to that which we ate in Iraq. Should be a great evening. "Bossert wrote back: "Thanks, Jared. With a promise like that, I can't refuse. Also, if you ever need it, my personal email is" (redacted). Bossert did not respond to CNN's request for comment; the email prankster said he was surprised Bossert responded given his expertise. White House officials acknowledged the incidents and said they were taking the matter seriously. Cyber experts consulted by CNN say the incidents are illustrative of how vulnerable Americans -- even those in the highest reaches of power -- remain to the potential threat of spear-phishing, the process through which officials are duped by hackers, and expose government computers and systems to various cyber threats. No one in any of these situations clicked any links making them vulnerable, and the prankster appears motivated by mischief not anything more malignant, so the severity of these White House pranks should not be overstated. But spear-phishers often begin the process by falsely posing as a friend or associate before asking the victim to take further action. "This shows how susceptible government officials are to spear-phishing in general," Adam Malone, a former cyber specialist and special agent for the FBI, told CNN. "Spear-phishing is the most common technique used by hackers to gain access to their victims." "I try and keep it on the humorous side of things," the email prankster told CNN. "I'm not trying to get the keys to the vault or anything like that." One such exchange appears to have possibly played a role in the tensions between then- White House Communications Director Anthony Scaramucci, who resigned from his job earlier today, and since-fired White House Chief of Staff Reince Priebus. Masquerading as Priebus, the prankster emailed Scaramucci's official account using a mail.com account on Saturday, the day after Priebus' resignation was announced. "I had promised myself I would leave my hands mud free," wrote the fake Priebus, "but after reading your tweet today which stated how; 'soon we will learn who in the media who has class, and who hasn't', has pushed me to this. That tweet was breathtakingly hypocritical, even for you. At no stage have you acted in a way that's even remotely classy, yet you believe that's the standard by which everyone should behave towards you? General Kelly will do a fine job. I'll even admit he will do a better job than me. But the way in which that transition has come about has been diabolical. And hurtful. I don't expect a reply." The very real Scaramucci responded: "You know what you did. We all do. Even today. But rest assured we were prepared. A Man would apologize." Fake Priebus wrote back: "I can't believe you are questioning my ethics! The so called 'Mooch', who can't even manage his first week in the White House without leaving upset in his wake. I have nothing to apologize for." Actual Scaramucci responded: "Read Shakespeare. Particularly Othello. You are right there. My family is fine by the way and will thrive. I know what you did. No more replies from me." In another exchange, Scaramucci was hoodwinked by the same prankster pretending to be Ambassador to Russia-designate Jon Huntsman Jr. "Who's (sic) head should roll first?" the bogus Huntsman asked from a Gmail account on Friday, before the Priebus termination had been announced. "Maybe I can help things along somewhat." "Both of them," responded the real Scaramucci, in an apparent reference to both Priebus and White House Senior Adviser Steve Bannon, about whom Scaramucci has been quite critical. After a few other nice messages of support from faux Huntsman, Scaramucci wrote, "Are you in Moscow now? If not please visit." Huntsman himself was also tricked, with the prankster pretending to be Eric Trump, the President's son. "Thanks for the thoughtful note," the ambassador-designate wrote to fake Eric Trump. "Russia will be a challenging but no doubt rewarding assignment." The fake Eric Trump responded with this suggestion: "Maybe we could have Dad sat (sic) on a horse, top off, giving the full Putin! He's in better shape than his suits suggest." Eric Trump, too, was similarly hoodwinked by the prankster emailing as his older brother, Donald Trump Jr., but he soon caught on and responded, "I have sent this to law enforcement who will handle from here." Neither Huntsman nor Trump would comment on the record. The email prankster told CNN he never heard from anyone in law enforcement about his email to Eric Trump. The email prankster tweets under the name @SINON_REBORN, where he posts his pranks, and describes himself as a "lazy anarchist." In June, he hoodwinked Lloyd Blankfein, CEO of Goldman Sachs and Michael Corbat of Citigroup, and he did the same to Barclays CEO Jes Staley in May. Staley, thinking he was being emailed by Barclays chairman John McFarlane, praised the man he thought was his colleague in effusive detail, saying among other things that he had "all the fearlessness of Clapton." The prankster said Staley was the most surprising of the responses, because it was the first one and because "he responded in such gushing detail." Will Trump brag abt being on THIS Newsweek cover? Now he's threatening war on North Korea. NEVER elect an insecure man president. 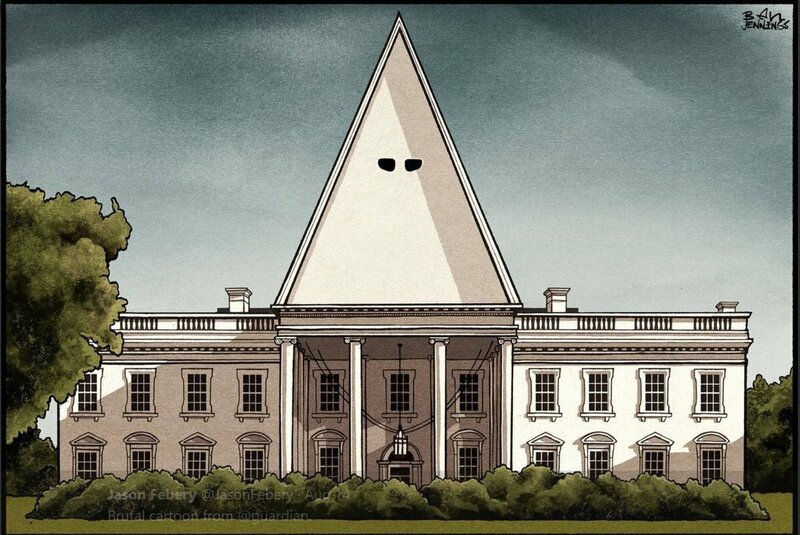 White House remodel is complete. "Miss Otis regrets she's unable... to lunch... today." That wasn't a sonic boom, that was the sound of millions of people's chins hitting the floor as their mouths fell open. The issues of dementia and fitness for office are now on every pundit's lips. What is being said behind closed doors? *Significantly, chief of staff and Trump-minder Kelly reportedly was invited to appear, yet was noticeably absent. As a fake news media member in good standing, I would like to apologize sincerely for forcing you to hold a campaign rally eight months into your first term as president. I'm sorry that in the course of that rally I forced you to misquote yourself and to devote one reference to Heather Heyer, the woman killed during the white supremacist rally in Charlottesville, versus an inordinate number of references to the journalists who cover you and your administration. I definitely should not have made you fail to mention the 10 American sailors who died or are missing from the Navy destroyer USS John S. McCain after it collided with an oil tanker Monday. That was callous of me, and I am deeply sorry. I also showed poor judgment in making you seem almost annoyed that you had to properly denounce the various hate groups that marched in Charlottesville chanting, "Jews will not replace us!" And I definitely shouldn't have had you say this during the rally: "I hit 'em with neo-Nazi. I hit them with everything. I got the white supremacists, the neo-Nazis. I got them all in there, Let's see. KKK, we have KKK." That almost made it sound like condemning hate groups made you the victim. Please accept my apology for that bit. It was callous and wholly inappropriate. While I'm apologizing for Nazi stuff, I'm sorry I entered your brain and forced you to express sympathy for Jeffrey Lord, a commentator who was recently fired from CNN for tweeting "Sieg Heil!" at the head of a liberal watchdog group. In retrospect, that was a weird and dreadfully timed thing to have you say, and I hope you will forgive me. I regret having you say the following about clean coal: "They're going to take out clean coal, meaning they're taking out coal, they're gonna clean it." Upon further reflection, that statement made it sound like you haven't the foggiest idea what the term "clean coal" means and are quite unintelligent. That is 100 percent my bad. Perhaps with time we can mend the damage my recklessness has done to your reputation. On two occasions, I lied to you, via telepathy, and convinced you that the cameras broadcasting your rally had been shut down because the media were too frightened to share your criticism of CNN and other outlets. That was transparently false, particularly since I watched the rally in its entirety on CNN. I'm sorry I made you lie about that. Rather than have you refer to Republican Sen. John McCain, a war hero currently battling brain cancer, by name, I took the cowardly and childish path of instructing you to mock and taunt him using the phrase, "One vote away." That was a reference to McCain's deciding vote against your health care bill, which would have repealed Obamacare. Hearing you screeching, "One vote away!" like an insolent child did not set the presidential tone I hoped it would. It was a terrible decision by me, and I am drowning in my own shame. Convincing you to say that you will, if necessary, shut down the government in order to build your preposterous border wall was folly of near-biblical proportions, framing you as either stubborn and narcissistic to the point of jeopardizing the country's fiscal well-being and doing real harm to Americans who rely on government services just to save face -- or a liar. I will never live that one down. 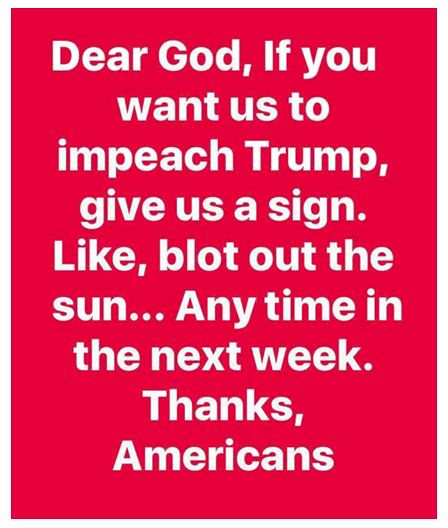 I could go on apologizing for the lies I implanted in the left frontal lobe of your brain, including, but not limited to the assertion that CNN's ratings are down (they're up); that there has been a historic increase in defense spending (your proposed increase is neither historic nor a done deal); and there weren't many protesters outside the rally (there were thousands). But what's the point? I have clearly failed you, and along with all media members, I'm responsible for your divisive rhetoric and mind-boggling unwillingness to step outside yourself for even one fraction of a moment and notice that you sound like an infantile madman. I promise, from here on, to pamper you, to coddle your ego, to deflect all blame on others and never to accurately report on you, because that causes you to call me fake news. Please accept this apology. I am not at all proud of the things I've made you do. And America shouldn't be either. President Trump is spreading fake news about former President Barack Obama's use of pardons. This morning (Aug 28) Trump retweeted a message from a conservative journalist that included two false assertions about pardons granted under former President Obama. He retweeted the bogus claim as a defense for his controversial pardon of Joe Arpaio, the former Arizona sheriff who was set to serve a jail sentence for his discriminatory policing. Pavlich wrote to Rhodes, “Your boss pardoned a traitor who gave U.S. enemies state secrets, he also pardoned a terrorist who killed Americans. 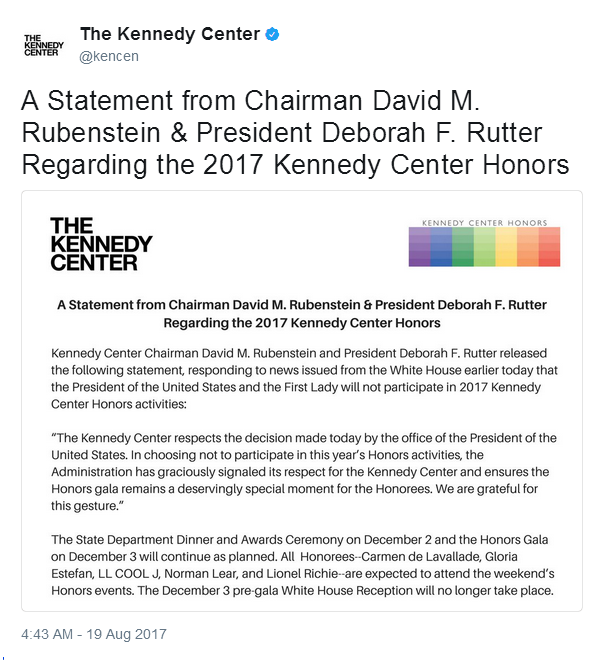 Spare us the lecture.” She is apparently referring respectively to Chelsea Manning, the former U.S. Army soldier convicted of leaking military documents, and Oscar López Rivera, a former leader of FALN, a Puerto Rican paramilitary group responsible for the deaths of six Americans. Manning and López Rivera were two of Obama's most controversial clemency cases. But Obama did not pardon either of them. Instead, he granted them commutations, allowing Manning and López Rivera to leave prison years before the end of their sentences. That is not the same as a pardon, which absolves a citizen of a conviction. Pavlich appeared to confuse the two processes. She did not correct or delete her tweet. Manning and López Rivera both served years in confinement before their commutation and still have their crimes on their record. By comparison, Trump not only absolved Arpaio of a recent criminal contempt conviction, but also spared him from a jail sentence he had yet to receive. Arpaio was scheduled to be sentenced in October and faced up to six months in jail. The U.S. Justice Department recommends waiting at least five years before pardoning a conviction. Trump also retweeted a message from Dinesh D'Souza. D'Souza has spent weeks pushing a false conspiracy theory that Jason Kessler, the man who organized the Charlottesville hate rally, is a former CNN employee. CNN has said Kessler is getting confused with an employee who shares that name. D'Souza posted yet another inaccurate tweet on Monday pushing this untrue theory. D'Souza is a conservative documentarian who pleaded guilty in 2014 to one felony count of making illegal contributions in the names of others. He was sentenced to five years probation, eight months in a halfway house and paying a $30,000 fine.